Sea Caves can be found at the following locations and are listed in descending order by size and quantity of sea caves. Click on the red bullseye on the map below for more information about each set of sea caves. 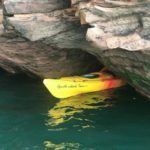 All the caves being ranked here are large enough to fit an 18′ tandem kayak; Devil’s Island, Meyers Beach, Sand Island, Romans Point, Madeline Island, Red Cliff, Stockton Island, Chequamegon Bay and Cat Island. 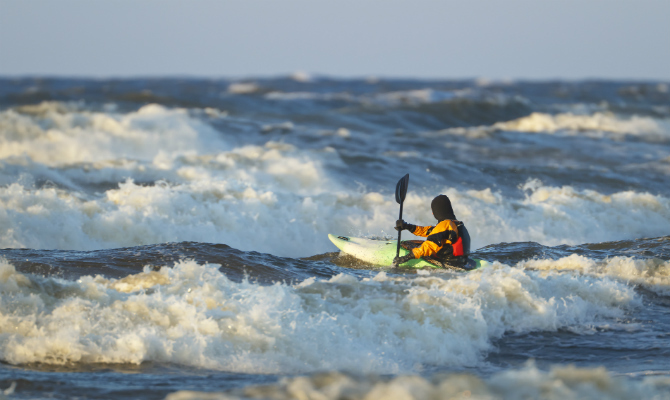 You can expect other paddlers at Meyers Beach. The other sea cave locations you will have mostly to yourself. You will need waves of 1.5 foot or less to enter the sea caves. 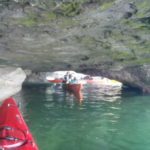 The hardest to access and is really only accessible by boat if you want to get out there and back in a day, but it has the best caves. Devil’s Island is the most exposed to wind and waves of all the sea cave locations. Sometimes you have to wait in line to get in to a cave, but they are still an awesome experience. The caves are amazing at Meyers but sometimes the crowds can detract from the overall experience. This is right up there with Devil’s Island as far as caves and only has a 4 star rating due to the fact that the crowds are present in July and August and AINL rules do not family pets or paddle board tours. Much closer than Devil’s and can be accessed by kayak in one day. Sand Island has more caves than Roman’s point but not as many as Meyers. Sand Island is a bit shorter but much more intricate stretch of caves. There is the added bonus that they are on an island and the 2 mile open water crossing keeps the crowds down. 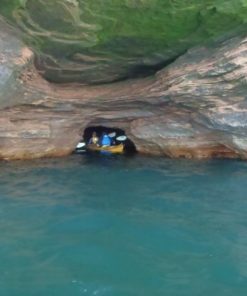 You rarely see motor boats at these caves. The crossing to these caves are dangerous, you are exposed from every direction, even a South wind can create waves and white caps by the time you are half way through the open water crossing to Swallow Point. 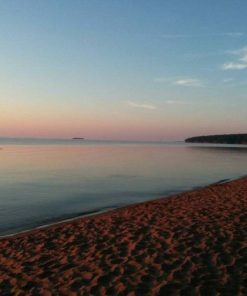 Located In Herbster, Wi and is accessible from the Bark Bay State Natural Area boat ramp. It has a few decent caves but without as many crowds. It is a bit more sheltered from the wind and has several public launch locations. The private property owners have ladders leading down the cliff, which makes this the sea cave location with the most extraction points. Point. 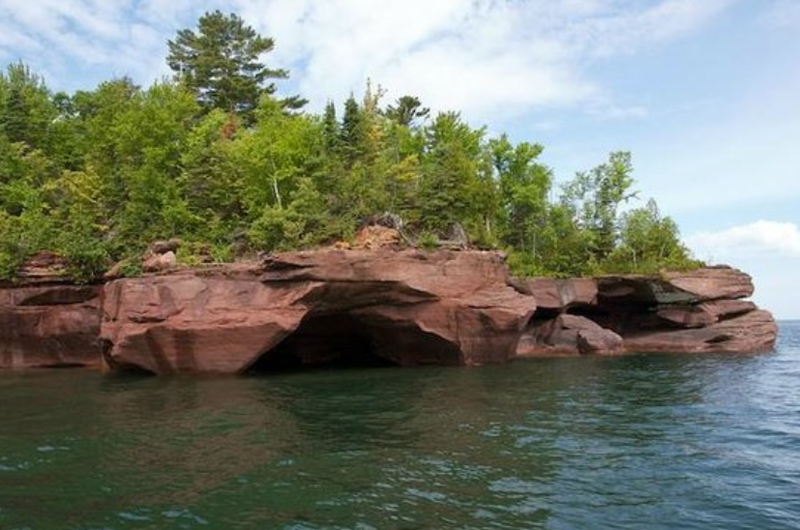 Stockton Island has a couple good caves and a famous miniature sandstone island known as balancing rock. There caves are located on the North East end of the island. 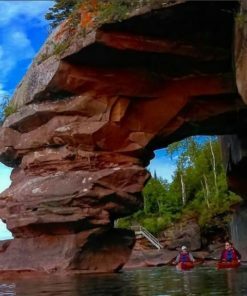 Crossing to Stockton is best done from Red Cliff or Madeline Island. 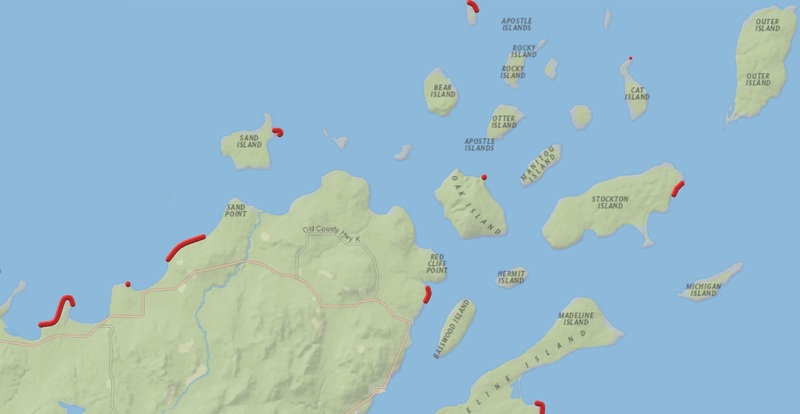 The crossing from Red Cliff is a bit more safe because you have Basswood and Hermit along the way which are both all public national lakeshore. 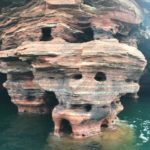 There are some really cool caves at Red Cliff with the added bonus of a shipwreck, sea arch and some remnants of Al Capone’s hideaway. 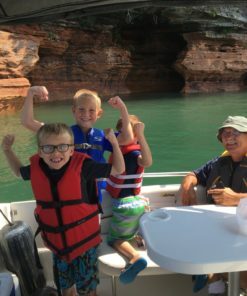 The accessibility and protection from the wind are better than anywhere else in the Apostle Islands. You will experience about the same amount of crowds as Madeline and you almost never see boats going into the caves. 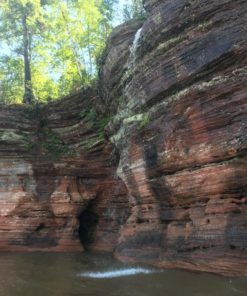 The caves are accessible from the Red Cliff Ojibwe Reservation in Red Cliff, Wi and you can put in right at the boat ramp at the casino. There is food and restrooms at the casino and lodging. 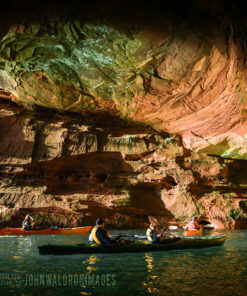 There are about 1/4 as many caves at Madeline as those before it on this list but they are fun caves to paddle and if you look closely you can find one tunnel cave and one underwater cave. 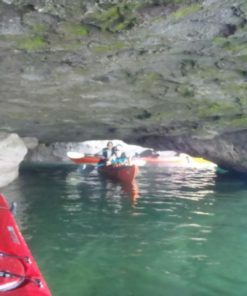 The caves won’t be as amazing as Devil’s, Meyers and Sand but it is very protected from a West wind, so a good option for sea cave paddling on a West wind day, which is primarily what we get through the summer months. This location will have more crowds than Romans but a bit fewer than Meyers. Any Reservation that is cancelled more than 48 hours in advance receives a full refund. If weather cancels your tour you receive a full refund. We try to give you at least 24 hours notice by text or email if weather is a concern. If we cancel the tour you receive a 100% refund. We do our best to get you out to your desired location. If weather does not permit we do not force you to go on a different tour. We will offer an alternative tour, a chance to reschedule or a 100% refund. 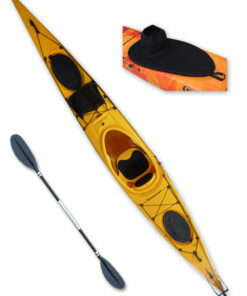 You must have previous kayak experience and know how to swim to rent a sea kayak. A 1 to 2 hour safety course is mandatory for all rentals and we reserve the right to require a guide for your rental. Our goal is to facilitate your adventure into one of the most unique and biodiverse destinations in North America. 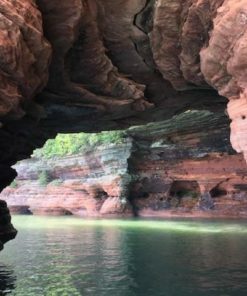 The Apostle Islands are a sandstone island achipelago that feature long stretches of towering sandstone cliffs nestled amonst pristine beaches. 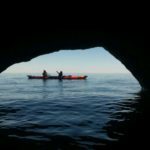 These islands are some of the last places to find old growth boreal forest and home to the famous sea caves. The sea caves are found in 3 spots (Meyer’s Beach, Sand Island and Devil’s Island). 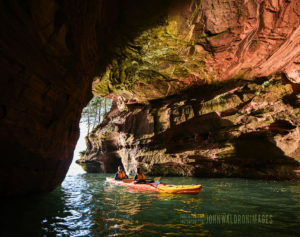 They are sandstone cliffs in which the waves have etched out winding caves that are just the right size for kayaks and paddle boards. Any questions you have for us please feel free to contact us, we are happy to answer them. 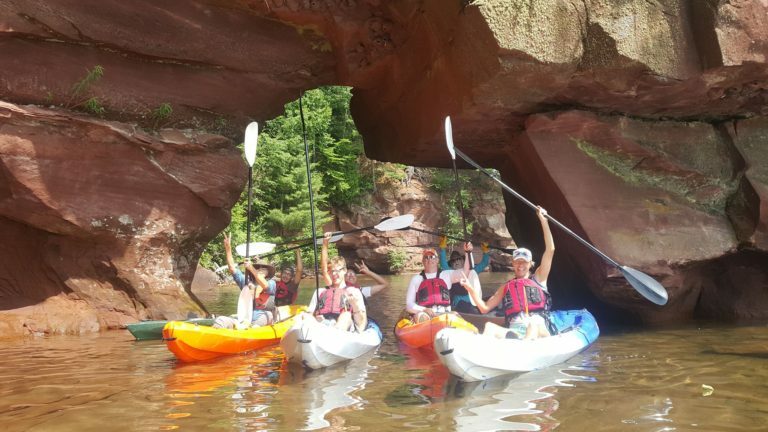 • Tours are appropriate for beginners and inexperienced paddlers. 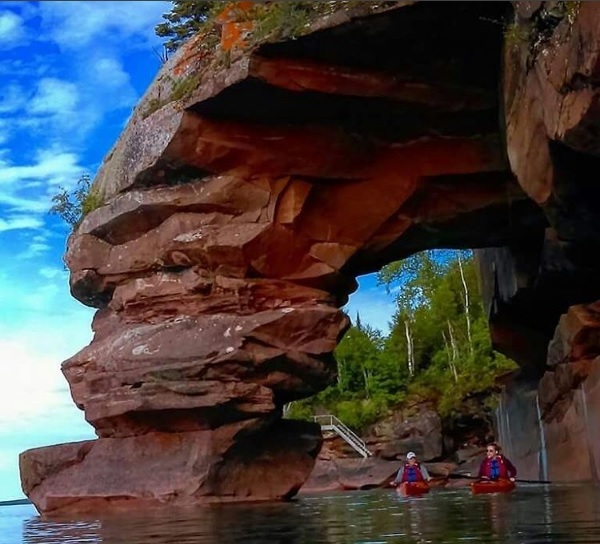 • If you do not have kayak experience we highly suggest that you go on a tour with a guide. 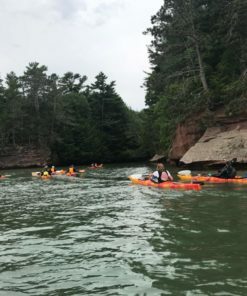 • It takes kayaking skills, you must be in good shape and you must be able to swim to kayak without a guide in the Apostle Islands. 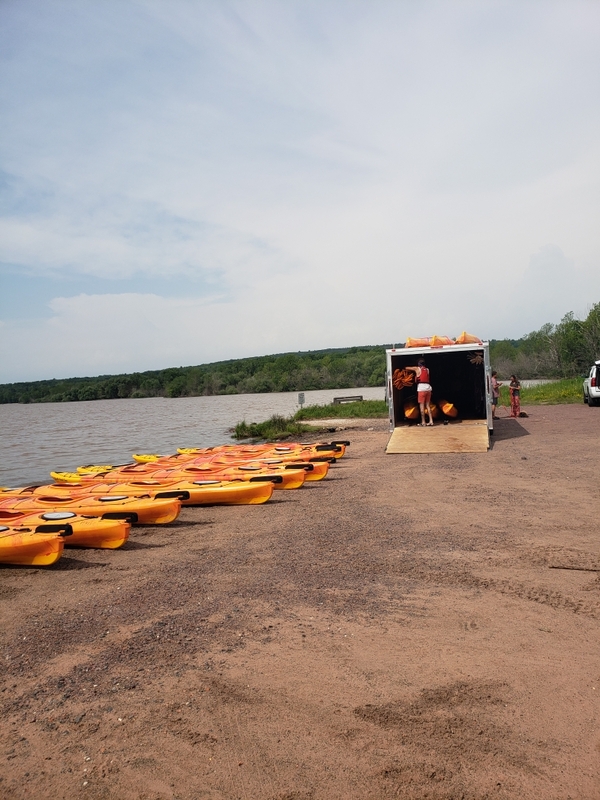 • Tours are appropriate for beginners and inexperienced paddlers as we only launch in safe paddling conditions and guides are equipped to tow if necessary. 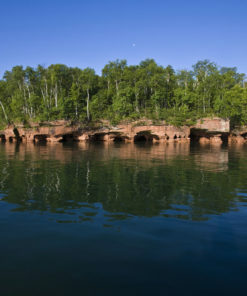 • We are the only outfitter in the Apostle Islands that shadows our Meyers Beach tours with a support vessel. 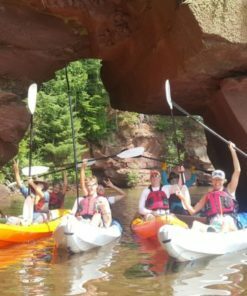 • If any member of your group does not want to kayak or is too young, they can follow the group in our Support Vessel and Coast Guard certified boat captain. • We even allow well-trained dogs to ride in the boat. 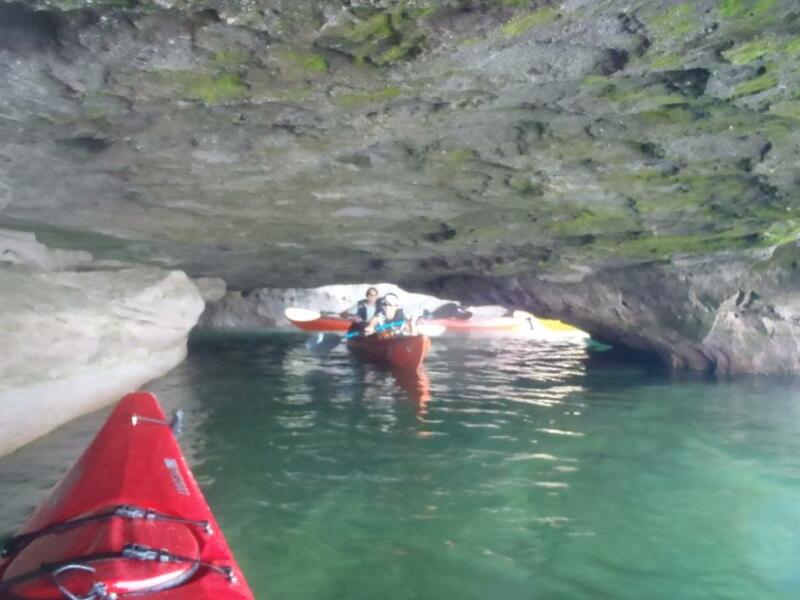 The AINL rules for outfitters do not allow dogs in kayaks at Meyers, Sand Island Or Devils Islands. 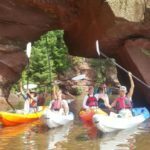 However, we can take dogs on all boat tours and have several options for kayak tours that are outside the AINL boundary where we do allow well trained and friendly dogs in kayaks on the kayak tour. 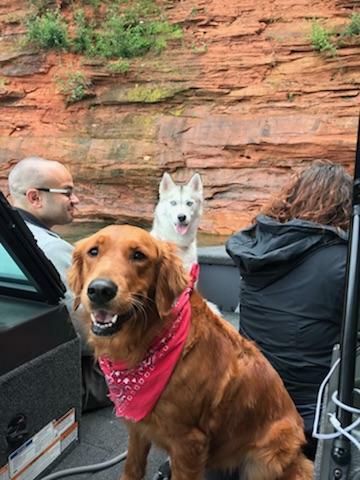 • If you are thinking of bringing your dog on a tour we ask that it not be the first time they have been on the water. • If you are bringing a dog in a kayak on a tour we ask that they have previous experience in a canoe or kayak. 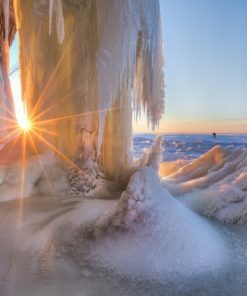 • Lake Superior is a sleeping dragon. You hear lake and think to yourself “I’ve kayaked on lakes before”. 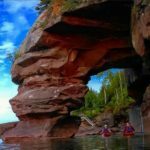 It is far more dangerous to kayak on Lake Superior than most oceanic shorelines in the United States. • The real danger is the water temperatures but the location of the lake lies right in the jet stream, so winds can be brutal as well. 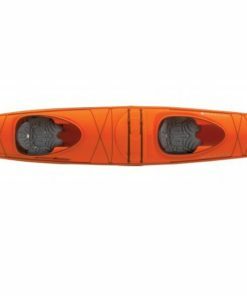 • If you are thinking of renting a kayak we highly encourage you to call us and we will spend as much time as you want answering whatever questions you have. 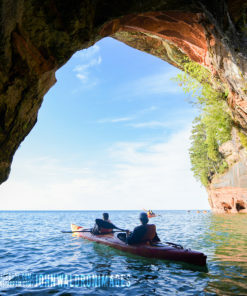 • If you haven’t kayaked on Lake Superior and you don’t have any questions, you should probably reconsider renting a kayak in the Apostle Islands. • We offer group discounts starting at 6 people 10% off, and the discounts increase as the group size grows. • We also offer group discounts to active and retired military and their immediate family members. 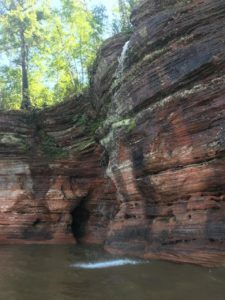 • Give us a call and we will discuss what type of discount we can offer and we’ll also tell where to find places off the beaten path that you can be one of the highlights of your visit to the Apostle Islands. We booked a kayak tour with a different company, but after waiting around for twenty minutes after the agreed check in time, we found the tour had in fact been cancelled. Bummed out didn’t come close to how we felt as it was the last day of our holiday. Chris was on site with his trailer and kayaks and hearing our misfortune, offered to take us out. 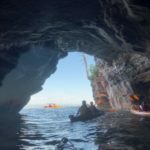 We navigated through sea caves and saw lots of Eagles! Chris expertly guideded us and answered all our questions along the way. Friendly and fun guide. Thanks for your saving grace Chris, much appreciated. This is the second time I have booked and they never disappoint – always welcoming and friendly. Such a great experience of learning about the surrounding environment. Eli is so knowledgeable and caring of the environment he easily draws you in to not only get the most out of your experience but come away feeling a part of nature. Will come back and book time and time again. but this was the best one we have been on. We went through the Meyers Beach Sea Caves which are magical and so peaceful. We had never seen them so close before. Trip to remember. My boyfriend and I had such an amazing time. This was my first time kayaking and definitely won’t be my last. Before we started Troy went through the steps so well that by the time I got in the kayak I felt like a pro. The sea caves were beautiful! It wasn’t super expensive and you definitely get your money’s worth. My brother & i went on a 3 hour kayak tour led by Danielle. It was a great experience, she taught us all about kayaking & some fun facts about the places/things we saw. Despite the waves we still got into the sea caves and had an awesome time! Definitely would come back to this company for more kayaking in the future! 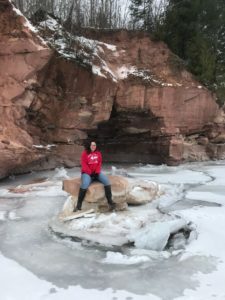 We have been visiting family in the area for 18 years and looking for something new and adventurous to do. These guys made our day! It was easy to book and Chris helped us become expert kayakers in no time. We also learned more about the history of the area than we ever knew before. Thanks! We stumbled upon this kayak place looking for something fun to day. The guys were great and Mike was a big help. 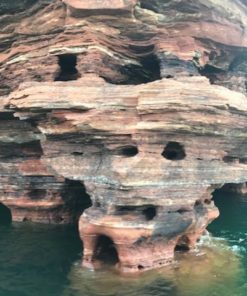 He told us to make sure we navigae the sea caves and we weren’t disappointed. Such a beautiful area and perfect day to be on the water. 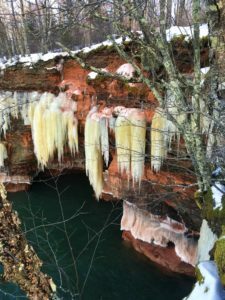 Sign up to receive email updates about discounts, opening dates and condtions of the various Apostle Islands Ice Cave locations.